California maps from Omnimap, the leading international map store with over 275,000 map titles. This page is under construction as we reorganize our California hiking maps. Return to main California maps page. Topo maps, travel maps, and much more. Pacific Crest Trail maps and guides for Washington, Oregon, and California. California Pacific Crest Trail maps also shown below. California State Park Hiking Maps by Redwood Hikes Press. California Surfing & Diving Maps by Franko's Maps. California Hiking Maps by Trails Illustrated. Hiking maps of the Sierra Nevada, State Parks, etc. from Tom Harrison. San Francisco Bay Area Maps. San Francisco Bay Area Trail maps. Napa & Sonoma Area Maps. California has two long-distance trail that traverses the state north/south - the famous Pacific Coast Cycling Trail and the new Sierra/Cascades Cycling Trail. It also has two east/west trails that cross the state; the Western Express and the Southern Tier trails. In addition there are countless back roads that are begging for a leisurely ride through the Wine Country, Gold Country, or through the desert. Click here for our California cycling maps list. California Fishing Maps. We stock numerous fishing maps for California lakes and reservoirs. Click here for our California fishing maps. California Raised Relief Maps. We have a great raised relief map of the state of California as well as several 1:250,000 sectional raised relief maps that cover much of California. Click here for 1:250,000 sectional raised relief maps of California. Click here for a raised relief map of the state of California. 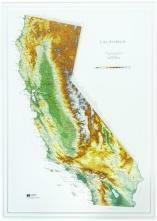 We stock all USGS topographic maps of California at all available scales. US Forest Service Maps for California. We stock USFS maps for numerous National Forests and Ranger Districts in California. Click here for our California Forest Service maps. California Wine Region Maps - click here. Lots of beautiful wine maps of world-famous California wine regions. Day & Section Hikes Pacific Crest Trail: Northern California. Wilderness Press. Many hikers dream of walking the entire length of the famed Pacific Crest Trail (2,650 miles from Canada to Mexico). But time, jobs, and other obligations get in the way. This new guide makes it easy to explore the most memorable stretches of the route in Northern California. While not intended for thru-hiking reference, the handy format and concise information makes this book a perfect companion for short trips on the PCT. Trips range from one day to multi-day adventures along the trail. Each trip is shown on a map and has an elevation profile, depicting all the ups and downs, with GPS coordinates given for trailheads. Includes a comprehensive ratings system (for scenery, trail condition, difficulty, and solitude), information on water sources, links to continuing trails, and other vital details. This title contains 32 trips in Northern California. Pacific Crest Trail Maps - California Maps. 1:63,360. USFS. Waterproof and tear-resistant maps. With 100 ft. contours. Folded maps. Coverage of the Southern California map. Coverage of the Transverse Ranges map. Coverage of the Southern Sierra Nevada map. Coverage of the Central Sierra Nevada map. $15.99 62-56815 Map #1. Southern California - the Mexican border to Big Bear Lake. $15.99 62-56816 Map #2. The Transverse Ranges - Big Bear Lake to Tehachapi Pass. $15.99 62-56817 Map #3. Southern Sierra Nevada - Tehachapi Pass to Le Conte Canyon. $15.99 62-56818 Map #4. Central Sierra Nevada - Le Conte Canyon to Barker Pass. $15.99 62-56819 Map #5. Northern Sierra Nevada - Barker Pass to Old Station. California State Park Hiking Maps. Redwood Hikes Press. The map is annotated with the locations of memorial grove markers, footbridges, panoramic viewpoints, and stairs, and trail mileages are marked. Since you can often walk for miles without seeing a trail marker, these annotations are useful for helping you keep track of your location. Unofficial trails and roads that don't appear on the official park map are also shown. We don't recommend that you use these trails, but if you accidently wander onto one, having it on the map will help you get back on track. The back of the maps usually have descriptions, photos, and elevation profiles of recommended hikes. Map size is 17 x 22 inches unfolded. The maps are double-sided. $6.95 62-56872-HA Half Moon Bay to Cupertino Bay Area Trail Map. 1:25,000. This two-sided map covers in detail the many regional parks in the hills above Woodside, Palo Alto, Portola Valley, Los Altos, and Cupertino. Besides full coverage of hiking trails, nearly all local roads are shown so that hikers can find their way to all available trailheads. For example, the map shows back entrances to Rancho San Antonio County Park that aren't shown on the official map. It also shows how the trails of neighboring parks connect to each other, making it much easaier to plan (for example) a hike from Palo Alto to Skyline Ridge that crosses through Arastradero, Foothills, Los Trancos, and Skyline Ridge preserves. 26 x 39" unfolded. $9.95 62-56872-HU Humboldt Redwoods State Park map. 1:25,000. This map covers all of Humboldt Redwoods State Park as well as three small neighboring parks: John B. Dewitt Redwoods State Natural Reserve, Benbow Lake State Recreation Area, and Richardson Grove State Park. A 1:500,000 scale map of the North Coast is also included. 26 x 39 inches unfolded. $10.99 62-56728 Mount Diablo Hiking Map. 1:25,000. This waterproof map includes Mount Diablo, Morgan Territory, Black Diamond Mines, and the Los Vaqueros Watershed. Map size is 27 x 39", printed on waterproof plastic, full color on both sides..
$6.95 62-56872-MU Muir Woods National Monument map. 1:12,500. 17 x 22 inches unfolded. $6.95 62-56872-PO Portola Redwoods State Park & Pescadero Creek County Park map. 1:25,000. 2008. This is the only trail map that shows the interconnected trail systems of Portola and Pescadero parks on a single sheet. The entire Pescadero park complex including Sam McDonald County Park, Memorial County Park, and Heritage Grove are shown. Three Skyline Ridge parks are also included: Long Ridge, Upper Stevens Creek, and Skyline Ridge. 19 x 28 inches unfolded. $10.95 62-56872-REN Redwood National Park North map. 1:25,000. This map plus its southern companion map covers all of Redwood National and State Parks, including Jedediah Smith Redwoods State Park, Del Norte Redwoods State Park, Prairie Creek Redwoods State Park, and Redwood National Park. It is the only commercially-available map to include the approximately 50 miles of new multi-use trails in the Mill Creek Watershed of Del Norte Redwoods State Park. 25 x 39 inches unfolded. $10.95 62-56872-RES Redwood National Park South map. 1:25,000. This map plus its northern companion map covers all of Redwood National and State Parks, including Jedediah Smith Redwoods State Park, Del Norte Redwoods State Park, Prairie Creek Redwoods State Park, and Redwood National Park. It is the only commercially-available map to include the approximately 50 miles of new multi-use trails in the Mill Creek Watershed of Del Norte Redwoods State Park. 25 x 39 inches unfolded. $6.95 62-56872-SL San Lorenzo Valley Trail Map. 1:25,000. This trail map includes Henry Cowell Redwoods State Park, Fall Creek, Pogonip, Quail Hollow Ranch Park, and Bonny Doon Ecological Reserve. Trails and dirt roads were drawn from newly-acquired GPS data with a resolution of about 250 feet and overlaid on USGS topography data. Map size is 17 x 22 inches unfolded. Bay Area Trail - Big Basin and Castle Rock Hiking Map. 1:25,000. Redwood Hikes Press. Two new maps that cover part of the Bay Area Trail. This double-sided map covers the Santa Cruz Mountains from the outskirts of Saratoga and Los Gatos to the Pacific coastline around Point Ano Nuevo. Castle Rock, Big Basin, Portola, Butano, and Ano Nuevo State Parks are fully covered, as are many regional parks of the South Skyline Boulevard area, such as Fremont Older Open Space Preserve, Upper Stevens Creek County Park, Sanborn County Park, and El Sereno Open Space Preserve. All official hiking trails were drawn from newly-acquired GPS data with a resolution of about 250 feet. Trail mileages are marked and most streets are labeled. To help you keep track of your location, the map shows the locations of memorial grove markers, footbridges, panoramic viewpoints, and stairs. The map also covers the complete Skyline-to-the-Sea Trail. ISBN 9781934127216. $10.95 62-56872-BIG 1 sheet, folded. Bay Area Trail - Carquinez Straits & Berkeley Hills Hiking Map. 1:25,000. Redwood Hikes Press. This trail map covers the northern section of the East Bay hills. It's currently the only comprehensive trail map of this region. One side includes Tilden and Wildcat Regional Parks, San Pablo and Briones Reservoir, and Briones Regional Park. The other side has the Carquinez Strait area, including Crockett Hills Regional Park, Carquinez Strait Regional Park, the Muir Heritage Land Trust properties, and the northern EBMUD watershed. Size is 26 x 39 inches unfolded. ISBN 9781934127193. $7.95 62-56872-CAR 1 sheet, folded. Sequoia and Kings Canyon National Parks - Generals Highway Hiking Map. 1:25,000. Redwood Hikes Press. This map covers the most popular day hiking areas of Sequoia and Kings Canyon National Parks. One side shows the northern half of the Generals Highway including Grant Grove and Redwood Mountain; the other side shows the southern half including the Lodgepole and Giant Forest area, Alta Peak, and Bearpaw Meadow. There's also a map showing the floor of Kings Canyon, including Cedar Grove and Roads' End. No other map shows all these areas at this level of detail. The more remote areas like Mineral King, the Atwell and Garfield Groves, and the Eastern Sierra trailheads are not included on this map. Size is 27 x 39 inches unfolded. ISBN 9781934127223. $7.95 62-56872-SE 1 sheet, folded. California Road and Recreation Map. 1:1,318,821. Benchmark Maps. Benchmark's California Road Map is the ideal portable planning tool and GPS companion for fast statewide travel. It's the only California road map that benefits from Benchmark's extensive field-checking, proven accuracy and cartographic excellence. Beautiful shaded-relief road map of California is on one side including mileage chart and insets for Napa & Sonoma Coast, Redwood Coast, Lake Tahoe, Yosemite Valley to Tioga Pass, Palm Springs, Monterey and Santa Barbara Coast. The reverse side shows the urban regions of Los Angeles, San Francisco, Sacramento and San Diego. Sample detail from the California recreation map. Highway 395 Road and Recreation Map. 1:213,220. Benchmark Maps. This excellent detailed regional map shows all the information for the popular Highway 395 route along the Eastern Sierras. Sample detail from the Highway 395 recreation map. Santa Ynez Valley Hiking Map. Franko's Maps. Franko's Guide Map of the Santa Ynez Valley is the ultimate guide to the Santa Ynez Valley and surrounding area, with loads of information on everything there is to see and do from wine tasting to bicycling to fishing. Side One of Franko's Guide Map of the Santa Ynez Valley shows the Santa Ynez Valley including the towns of Los Olivos, Solvang, Buellton, and Santa Ynez, and close-ups of the towns of Solvang and Los Olivos. Side Two of Franko's Guide Map of the Santa Ynez Valley shows the Santa Barbara Wine Country from Santa Barbara to Santa Maria including Lompoc and the Foxen Canyon Wine Trail. Side Two also features a close-up of the popular Lake Cachuma and information on fishing, boating, and camping around this beautiful lake. Printed on waterproof and tear-resistant synthetic paper, map size is 26.5 x 18.5 inches. $7.99 62-56739 1 sheet, folded. Surfing and Diving Maps of the California Coast and Islands. Franko's Maps. Franko's makes numerous diving maps for poopular diving areas around the world. A recent addition to the line are their surfing maps. $7.99 62-56873-LAS Los Angeles County Surf Map. 14 x 21"
$7.99 62-56873-ORS Orange County Surf Map. $7.99 62-56873-SBS Santa Barbara County Surf Map. Santa Catalina Hiking/Diving Map. Franko's Maps. Side 1 shows Franko's Map of Santa Catalina Island featuring the most amazing, beautiful and perfectly accurate shaded relief of the Island, with it's surrounding waters depicted in descending hues of ocean blues to indicate actual ocean bathymetry and depth contours. Shaded relief accuracy is derived from USGS digital elevation models, as interpreted by ArcView, a geographic computer program from ESRI. The ocean depth contours are a direct trace of the local NOAA charts, and thus, in addition to being beautiful, are also accurate. Catalina Island's miles of dirt roads are shown criss-crossing the island interior and along it's coast, with mileages indicated. Printed on waterproof and tear-resistant synthetic paper. $7.99 62-56738 1 sheet, folded. Anza-Borrego Desert State Park hiking map. 1:72,000. Earthwalk Press. An excellent hiking map of this popular state park near San Diego. $9.95 62-2408 1 sheet, folded. California National Park Hiking Maps. Map detail from the Yosemite N.P. map. $11.95 63-2100-252 Channel Islands N.P. #252. 1:50,000 & 1:25,000. $11.95 63-2100-221 Death Valley N.M. #221. 1:165,000. $11.95 63-2100-226 Joshua Tree N.M. #226. 1:80,000. $11.95 63-2100-256 Mohave National Preserve. #256. 1:125,000. $11.95 63-2100-218 Redwood N.P. #218. 1:70,000. $11.95 63-2100-253 Santa Monica Mtns. National Recreation Area. #253. 1:40,000. $11.95 63-2100-205 Sequoia/Kings Canyon N.P. #205. 1:80,000. $11.95 63-2100-206 Yosemite N.P. #206. 1:80,000 & 1:40,000. Sierra Nevada Road Map. 1:500,000. Imus Geographics. From Lassen Volcanic National Park through the High Sierra to Tehachapi Pass, this map displays the entire Sierra Nevada in a continuous sweep of dramatic mountain landscape. Size is 30 x 50 inches, folded. Note that the flat and laminated maps are printed on heavier poster-weight paper. $9.95 62-56726 1 sheet, folded. $29.95 62-56726R 1 sheet, flat. $39.95 62-56726L 1 sheet, laminated. California Gold Country. Actual. This artist's rendition shows the foothills of the Sierra Nevada and the locations of recreation and historic sites. A second map shows the main roads in the area. In my opinion this map is a good idea that needs a little finishing polish; the road map covers the main roads, but not the backroads which make exploring the Gold Country so much fun and the artist's rendition of the terrain just doesn't capture the vertical relief in the area. A new map by the same group is due shortly for the Columbia River Gorge - hopefully it will show more detail. Yosemite Road and Recreation Map. 1:1,318,821. Benchmark Maps. This map includes a regional map of the surrounding area, with special enlargements of the Park and Yosemite Valley on the reverse. Every rock and crag is beautifully mapped, with points of interest listed and described. Sample detail from the Yosemite recreation map. $9.95 63-2100-306 Yosemite National Park Southwest - Yosemite Valley & Wawona. $9.95 63-2100-307 Yosemite National Park Northwest - Hetch Hetchy Reservoir. $9.95 63-2100-308 Yosemite National Park Northeast - Tuolumne Meadows and Hoover Wilderness. $9.95 63-2100-309 Yosemite National Park Southeast - Ansel Adams Wilderness. $32.95 63-2100-PYOS Yosemite N.P. Sectional Map Pack - discounted. 1:40,000. Includes 63-2100-306 Yosemite Valley & Wawona, 63-2100-307 Hetch Hetchy Reservoir, 63-2100-308 Tuolumne Meadows, and 63-2100-309 Ansel Adams Wilderness maps. Hiking maps of Yosemite National Park. Rufus Graphics. Rufus Graphics produces three maps of the most popular sections of Yosemite National Park; Tuolumne Meadows, Wawona & Mariposa Grove, and Yosemite Valley. The three maps all have a detailed map of the main area of interest on the front showing roads, trails, elevation, picnic areas, campsite, and much more. The reverse shows detailed tourist information including information on wildlife, flora, natural history, camping and much more. Published in cooperation with the Yosemite Conservancy and the Yosemite Association. $3.95 62-56871-TU Tuolumne Meadows Map and Guide. 2006. Includes descriptions of popular hikes, including distance, elevation gain, route description, starting point, etc. Map detail from the Tuolumne Meadows district map. Front of the Tuolumne Meadows district map. Reverse of the Tuolumne Meadows district map. $3.95 62-56871-WA Wawona and the Mariposa Grove Map and Guide. 2006. Includes maps of Wawona, Mariposa Grove, and an overview map from Fish Camp/Tenaya Lodge to Wawoma, Mariposa Grove and slightly beyond. Map detail from the Wawona and the Mariposa Grove district map. Front of the Wawona and the Mariposa Grove district map. Reverse of the Wawona and the Mariposa Grove district map. $3.95 62-56871-YO Yosemite Valley Map and Guide. 2010. Includes the main map on the front, showing trails, the best tourist viewpoints and sites, and the recommended hiking trails. The reverse has numerous photos and text to help visitors get the most out of their visit to Yoesemite Valley. Map detail from the Yosemite Valley district map. Front of the Yosemite Valley district map. Reverse of the Yosemite Valley district map. Yosemite Valley Hiking Map. 1:24,000 - 1:350,000. Gecko Maps. This attractive map includes three inset maps; on one side is detailed a 1:24,000 topographic hiking map of the main Yosemite Valley showing hiking trails, tourist facilities, etc. On the reverse is a 1:350,000 overview map of the Yosemite National Park, a panoramic map of Yosemite Valley, and a panoramic map of the back side of Half Dome. Bilingual. $12.95 62-56743 1 sheet, folded. $11.95 63-2100-803 Lake Tahoe Basin Map. #803. 1:63,360. $11.95 63-2100-804 Yuba & America Rivers Map, Tahoe National Forest. #804. 1:63,360. $11.95 63-2100-805 Sierra Buttes & Donner Region Map. #805. 1:63,360. Lake Tahoe Basin Trail Map. 1:62,000. Adventure Maps. The Lake Tahoe, California Mountain Biking and Hiking Adventure Trail Map is a waterproof, topographic map that includes a route guide covering trails throughout the Lake Tahoe Basin, Truckee, Donner Summit, Desolation Wilderness, Granite Chief Wilderness, Mt. Rose Wilderness and Hope Valley. This also includes detailed map and route descriptions for mountain bike trails, hiking trails, horseback riding trails and nordic/cross-country skiing trails in the Lake Tahoe Basin and Truckee. In addition to its popular downhill ski resorts and deep blue waters, the Lake Tahoe Basin is renowned for having some of the best mountain biking, hiking, horseback riding and cross-country skiing terrain in the world. The alpine climate, forested slopes, granite peaks and abundant lakes and streams create a spectacular outdoor recreation destination for all abilities. This trail map displays, describes and rates the majority of the trails and other routes in the Lake Tahoe area in a clear and concise format. Size is 27 x 39 inches. Sample detail from the Lake Tahoe hiking map. Lake Tahoe Water Trail Map. 1:48,000. Adventure Maps. The Lake Tahoe Water Trail Map & Guide is a waterproof, topographic map that includes detailed paddling and boating information for Lake Tahoe and Fallen Leaf Lake. The Lake Tahoe Water Trail Map & Guide was developed to create a unique paddling opportunity and provide visitors with an ecologically sustainable alternative for recreating in this wonderful place. It is designed to help plan custom paddling and boating adventures along the shores of Lake Tahoe. It can also be very useful to power boaters and fisherman for navigating this large body of water. This map combines a highly detailed topographical map of the Lake Tahoe, including GPS coordinates and Lat/Long grids, with a detailed table of near-shore services around the lake. Color coded numbers on the map correspond to description lines in the information table to help in all phases of planning your paddling or boating itinerary. Each description line provides necessary information about a specific site (phone numbers, reservation information, available amenities, etc. Size is 27 x 39 inches. John Muir Trail Map Pack. 1:63,360. 2009. This map-pack has 13 topographic amps, each 8-1/2" x 11" covering about one day of travel on the trail. Contour interval is 80 feet. $9.95 62-5693AA Ansel Adams Wilderness hiking map. 1:79,200. 80 ft. contours. $9.95 62-5693BI Bishop Pass hiking map. 1:63,360. 80 ft. contours. $9.95 62-5693BO Bodie Hills hiking map. 1:79,200. 80 ft. contours. $9.95 62-5693DF Devils Postpile hiking map. Minarets-Agnew Meadows, Thousand Island Lake. 1:39,600 (one inch = .625 miles). 80 ft. contours. $8.95 62-5693DL Dinkey Lakes Wilderness hiking map. 1:42,240. Detailed shaded-relief topographic map of the Dinkey Lakes area of the Central Sierra. $9.95 62-5693EM Emigrant Wilderness hiking map. 1:63,360. 2 80 foot contours. $9.95 62-5693GO Golden Trout Wilderness hiking map. 1:63,360. 80 foot contours. $9.95 62-5693HB Half Dome Hiking/Topographic hiking map. 1:31,680 (one inch = 1/2 mile). Glacier Point-Yosemite Creek and Tenaya Lake-Little Yosemite Valley. 80 ft. contours. $8.95 62-5693HE Hetch Hetchy Trail hiking map. 1:63,360. Detailed shaded-relief topographic map of the Hetch Hetchy region, including Lake Vernon, Laurel Lake, Lake Eleanor, Cherry Lake, Pate Valley, White Wolf, Kibbie Lake, and Rancheria Falls. $9.95 62-5693HO Hoover Wilderness hiking map. 1:63,360. Detailed shaded-relief topographic map of the Hoover Wilderness region, including North Yosemite boundary, Bridgeport, Leavitt Meadows, Twin Lakes, Lundy Lake, Virginia Lakes, Green Creek, Buckeye Creek, and Matterhorn Peak. .
$8.95 62-5693KE Kearsarge Pass - Rae Lakes Loop hiking map. Includes trails in Sequoia/Kings Canyon N.P, including Paradise Valley, Vidette Meadow, Charlotte Lake, Onion Valley, Bubbs Creek. ISBN 1-877689-84-X. $9.95 62-5693KI Kings Canyon High Country hiking map.1:63,360. Covers the area from Bubbs Creek to Wanda Lake and includes Mt. Pinchot, Marion Peak, and Mt. Goddard. Contour interval is 80 feet. $9.95 62-5693MB Mammoth High Country hiking map.1:63,360. Covers the area from Mono Lake to Cascade Valley, including Devils Postpile, Mammoth Mountain, and McGhee Creek. Contour interval is 80 feet. $8.95 62-5693MI Mineral King hiking map. Includes trails in Sequoia/Kings Canyon N.P., including Bearpaw Meadow, Franklin Pass, Little Five Lakes, Hockett Meadow, High Sierra Trail, Funston Meadow, Silver City, Chagoopa Plateau. $9.95 62-5693MO Mono Divide High Country hiking map.1:63,360. Covers the area from Wanda Lake to Cascade VAlley, including Florence Lake and Lake Edison. Contour interval is 80 feet. $8.95 62-5693MN Mono Lake hiking map. 1:63,360. 80 foot contours. $9.95 62-5693MT Mt. Whitney High Country hiking map. 1:63,360. Covers the area from Mineral King to Bubbs Creek and includes Mt. Whitney, Triple Divide Peak, and Giant Forest. Contour interval is 80 feet. $9.95 62-5693WH Mt. Whitney Zone hiking map. 1:31,680. 80 foot contours. $9.95 62-5693PA The Palisades hiking map. 1:31,680. Detailed shaded-relief topographic map of the Palisades area of the Central Sierra. Covers Palisade Basin, North Palisades, Mt. Sill, Mt. Jepson, Mt. Winchell, Big Pine Lakes, Thunderbolt Peak, Norman Clyde Glacier, Middle Palisade Glacier. $9.95 62-5693SE Sequoia/Kings Canyon Recreation hiking map. 1:125,000. Includes the surrounding portions of Sierra, Sequoia, and Inyo National Forests. Contour interval is 200 feet. $12.99 62-5693SIE Sierra National Forest hiking map. 1:158,000. $9.95 62-5693TU Tuolomne Meadows hiking map. 1:42,240. Detailed shaded-relief topographic map of the Tuolumne Meadows area of the Yosemite National Park. Covers May Lake, Tenaya Lake, Merced Lake, Elizabeth Lake, Glen Aulin, Sunrise, Vogelsang, and Waterwheel Falls. $9.95 62-5693YO Yosemite High Country hiking map.1:63,360. Includes the surrounding areas of Sierra, Stanislaus, and Inyo National Forests. Contour interval is 80 feet. $9.95 62-5693YP Yosemite Natl.Park hiking map. 1:125,000. Includes the surrounding areas of Sierra, Stanislaus, and Inyo National Forests. Contour interval is 200 feet. $10.95 62-5693YQ Yosemite Valley hiking map. 1:24,000. Unique legend panel with five languages - English, Spanish, French, German, and Japanese. Contour interval is 40 feet. $4.95 62-5693AN Angel Island & Alcatraz Island hiking map. 1:12,000. Covers Alcatraz, the famous prison island in San Francisco Bay, as well as the often overlooked Angel Island. $5.95 62-5693BE Bear Valley Day Hikes hiking map. 1:18,000. $8.95 62-5693BH Big Rock Ridge & Indian Valley hiking map. 1:18,000. $8.95 62-5693DI Dipsea & Mountain Play hiking map. 1:15,840. $5.95 62-5693FI Five Brooks Day Hikes hiking map. 1:18,000. $5.95 62-5693LI Limantour Day Hikes hiking map. 1:18,000. $5.95 62-5693MD Mt. Burdell - Olompali Day Hikes hiking map. 1:18,000. $8.95 62-5693MU Mt. Tamalpias hiking map. 1:24,000. 40 foot contours. $8.95 62-5693NO Novato - North Marin County hiking map. 1:24,000. $5.95 62-5693PB Palomarin Day Hikes hiking map. 1:18,000. $5.95 62-5693PH Pierce Point Day Hikes hiking map. 1:18,000. $9.95 62-5693PI Pine Mountain hiking map. 1:24,000. Covers Audubon Canyon Ranch, French Ranch, Roy's Redwoods, Cascade Canyon, Loma Alta, and White Hill. $9.95 62-5693PR Pt. Reyes N.S hiking map. 1:48,000. This is the only shaded-relief, topographic map ever produced of the Seashore. Covers all hiking and biking trails, plus trails in Samuel P. Taylor and Tomales Bay State Parks. Contour interval is 80 feet. New series, printed on Polyart, with lat-long and UTM. $5.95 62-5693PN Point Reyes North hiking map. 1:67,320. $5.95 62-5693PS Point Reyes South hiking map. 1:67,320. $8.95 62-5693SR San Rafael & Central Marin County hiking map. 1:24,000. $9.95 62-5693SO Southern Marin hiking map. 1:24,000. Sample detail of the Death Valley map. $9.95 62-5693DC Death Valley Recreation hiking map. 1:250,000. Covers the entire Death Valley region, including the new expanded boundaries. $9.95 62-5693JO Joshua Tree Recreation hiking map. 1:125,000. This is the only topographic map ever produced showing the entire park on a single sheet. Contour interval is 50 meters; elevations in both meters and feet. $9.95 62-5693MM Mojave National Preserve hiking map. 1:250,000. The only topographic map available for teh newest member of the National Park system in California. Contour interval is 200 feet. $9.95 62-5693SD San Diego Backcountry: Anza-Borrego hiking map. 1:125,000. Covers the entire Anza-Borrego Desert as well as a portion of the Cleveland National Forest. Contour interval is 200 feet, with elevations in both meters and feet. Printed on Polyart, with lat-long and UTM. $9.95 62-5693DE Desolation Wilderness hiking map. 1:42,240. One of the most popular day-hiking and backpacking areas in the Lake Tahoe area. Contour interval is 40 feet. $9.95 62-5693LT Lake Tahoe Recreation hiking map. 1:71,280. Includes the route of the Lake Tahoe Rim Trail. The only topographic map that shows all of Lake Tahoe on a single sheet. 80 foot contours. $9.95 62-5693MS Mt. Shasta Wilderness hiking map. 1:63,360. The only shaded-relief map ever produced of this beautiful mountain. Contour interval is 80 feet. $9.95 62-5693AF Angeles Front Country hiking map. 1:63,360. Covers the portion of the San Gabriel Mountains between Placerita Canyon Park and Chilao Campground. Contour interval is 80 feet, with elevations in meters and feet. $9.95 62-5693AH Angeles High Country hiking map. 1:63,360. Covers the San Gabriel Mountains from just east of Chlao to Lytle Creek. Contour interval is 80 feet; elevations in meters and feet. $9.95 62-5693CU Cuyamaca Rancho State Park hiking map. 1:31,680. This is a beautiful State Park in San Diego County that is very popular with hikers, mountain bikers, and equestians. Contour intervalis 40 feet. $9.95 62-5693BB Mt. Baldy hiking map. Cucamonga Wilderness. 1:31,680 (one inch = 1/2 mile). 80 ft. contours. $8.95 62-5693MW Mt. Wilson hiking map. 1:31,680. 80 foot contours. $9.95 62-5693PM Pt. Mugu State Park. 1:31,680. (Tom Harrison). $9.95 62-5693SG San Gorgonio Wilderness hiking map. 1:42,520. Covers the entire Wilderness area with Trail mileages and trail camps shown. Contour interval is 80 feet. $9.95 62-5693SJ San Jacinto Wilderness hiking map. 1:42,240. Covers both the State Park and National Forest wilderness areas. Contour interval is 80 feet. $9.95 62-5693SH Sespe Wilderness hiking map. 1:63,360 (1 inch = 1 miles). 100 ft. contours. $8.95 62-5693VE Verdugo Mountains Parks & Open Space hiking map. 1:24,000. Covers Brand Park, Henderson Canyon, Stough Park, La Tuna Canyon, Wildwood Canyon Park, Beaudry North & South Motorways, Brand Motorway, Chandler Motorway, Hostetter Motorway, Las Flores Motorway, and Verdugo Motorway. Hiking maps for California's National Parks, National Forests, State Parks, and popular trails hiking map. $12.95 62-5674A Channel Islands N.P. hiking map. 1:24,000. (USGS). $11.95 63-2100-221 Death Valley N.M. hiking map. 1:133,000. (National Geographic #221). $5.95 62-5674D Devil's Postpile N.M. hiking map. 1:24,000. (USGS). $11.95 63-2100-226 Joshua Tree N.M. hiking map. 1:133,000. (National Geographic #226). $12.95 62-5674E Lassen Volcanic N.P. hiking map. 1:62,500. (USGS). $12.95 62-5674G Pt. Reyes N.S. hiking map. 1:62,500. (USGS). $11.95 63-2100-218 Redwood N.P. hiking map. 1:63,000. (National Geographic #218). $11.95 63-2100-205 Sequoia/Kings Canyon N.P. hiking map. 1:112,000. (National Geographic #205). $5.95 62-5674K Whiskeytown - Shasta - Trinity N.R.A. hiking map. 1:24,000. (USGS). $11.95 63-2100-206 Yosemite N.P. hiking map. 1:100,000. (National Geographic #206). $12.95 62-5674L Yosemite N.P. hiking map. 1:125,000. (USGS). $12.95 62-5674N Yosemite Valley hiking map. 1:24,000. (USGS). Lassen Volcanic National Monument hiking map. 1:48,000. Earthwalk Press. A great hiking map of this active volcanic area in northern California. Lassen last erupted in 1915-1917, leaving a classic volcanic terrain for hiking and investigation. While the landscape has recovered, the peak is still spectacular and the trails around the base and lower slopes are well worth the trip. $9.95 62-2410 1 sheet, folded. Whiskeytown - Shasta - Trinity Hiking Map. 1:50,000. Earthwalk Press. A good waterproof map of this overlooked but superb hiking area in northern California. Great trout fishing, remote trails - a good alternative to the Sierran foothills with fewer people. $3.95 62-2425 1 sheet, folded. Kern River Sierra Topographic Map. 1:62,500. Extremeline, 2011. The map features the hiking and mountain biking trails, rock climbing spots, whitwater launches and named rapids, giant sequoia groves, winter trailheads, water sports, fishing and hunting access, and other recreational opportunities in the Kern River Valley and Southern Sierra region. Ranging from 10,000 feet to 2,000 feet in elevation, the rugged and diverse land of the Kern River Sierra encompasses the Giant Sequoia National Monument, Camp Nelson, Black Rock Station and the Kern Plateau, Kennedy Meadows, Kernville, Lake Isabella, Keyesville, Greenhorn Mountains, Piute Mountains, the North Fork and South Fork of the Kern River, and much of the Domeland, Southern Sierra, and Golden Trout Wilderness. Double-sided map, size is 32 x 28 inches unfolded. Sample detail from Kern River Sierra topographic map. $12.95 62-56672 1 sheet, folded. Golden Gate Hiking & Biking Map. Map Adventures. From Northern San Francisco to Southern Marin. Explore the Golden Gate National Recreation Area from Lands End, the Presidio, crossing the Golden Gate Bridge to Marin, Muir Beach and the Coastal Trail. Mount Tamalpais, locally know as Mt. Tam, is surrounded by preserves and open spaces. It offers a variety of walks and hikes – mountain summits with spectacular ocean views, sandy beaches, quiet nature preserves, and freshwater lakes and ponds. Bicycles are a great way to explore the area's coastal towns, mountain roads, and lakes. Mt. Tam, the birthplace of mountain biking as we know it today, is a haven for both road and mountain bikers. Index showing coverage of both maps. Golden Gate map - sample detail. Golden Gate map - front side of the map. Golden Gate map - reverse of the map. Mt. Tam. map - sample detail. Mt. Tam map - front side of the map. Mt. Tam map - reverse side of the map. $8.95 62-56733 Golden Gate Hiking Map. 1:33,330. $8.95 62-56734 Mt. Tam Hiking Map. 1:25,000. 18 x 24". Mount Diablo Hiking Map. 1:25,000. Redwood Hikes Press, 2015. ISBN 9781934127278. This waterproof map includes Mount Diablo, Morgan Territory, Black Diamond Mines, and the Los Vaqueros Watershed. Map size is 27 x 39", printed on waterproof plastic, full color on both sides. $10.99 62-56728 1 sheet, folded. Trail Map of Mount Diablo State Park. Mt. Diablo Interpretive Association, 2009. The Mount Diablo Trail Map is a detailed topographic map printed on water resistant paper and is a "must have" for all visitors to the park. The casual visitor who is simply interested in picnic areas and roads as well as the serious hiker who wants to explore the mountains back country will find all the details they need on this one map. This is the most detailed, up to date map of the park. All 187 trails in the park are clearly shown and adjoining trails that lead into the park have also been included. Trails suitable for bicyclists and equestrians are marked and those hiking with GPS will be pleased with the detailed elevation and UTM (Universal Transverse Mercator) grid provided. The back of the map welcomes you to the mountain with general information, park rules and specific information about the mountains natural history and points of interest. $12.99 62-56735 1 sheet, folded. King Range National Conservation Area - The Lost Coast hiking map. Scale approx. 1:64,000. BLM. The map covers all of the King Range NCA, from north of Punta Gorda Lighthouse to south of Shelter Cove/Seal Rock. The front of the map has a detailed topographic map showing the topography of the King Range area of Northern California. Hiking and horse trails, camping information, park facilities, and other information are noted on the map. The front also has summaries of the 10 most popular trails in the NCA. The reverse side has information on the main features of the area and suggestions for things to do and see. $8.99 62-56747 1 sheet, folded. San Francisco Bay Trail Cycling Atlas. 1:75,000 + city maps. Bikeline/Esterbauer. 120 pages. The San Francisco Bay Trail is a pleasant combination of history workshop and bicycle tourism, of cultural enjoyment and charming flora and fauna. It traverses downtown San Francisco as well as the "San Francisco National Wildlife Refuge" and leads through almost 100 parks or protected reserve lands. In English. Index map of the route covered. $23.95 66-2279-SFB S.F. Bay Area guide/map. San Francisco Bay Recreation Map. Franko's Maps. Complete Map and Guide to the Greater San Francisco Bay, from the Wine Country in the north to San Jose in the south. It includes close up views of Sausalito, Angel Island. Treasure Island, Alcatraz, Alameda, Oakland and Berkeley. This the site of the 2013 America's Cup Race and thus the map shows all of the marinas, fishing piers, and yacht harbors on the Bay. This is not a detailed street map of San Francisco city, but this is a great map for those wanting to get out of Sasn Francisco to the wine country, the East Bay and UC Berkeley, Stanford University, or Half Moon Bay. The reverse side has more detailed coverage of the central part of the Bay, from Tiburon to Oakland. Sample detail from regional side of the San Francisco Bay area map. Sample detail from detailed side of the San Francisco Bay area map. $9.99 62-5687-SFB 1 sheet, folded. Sonoma Valley Trails Map. 1:30,000. Map Adventure. Explore the most beautiful and historic parks in Sonoma County - experience first hand the mountains and valleys that make up wine country. $5.95 62-56744 1 sheet, folded. Sonoma Valley & Carneros Trails Map. 1:30,000. Map Adventure. Explore the most beautiful and historic parks in Sonoma Valley and the Carneros region. The map shows bikeways, suggested day trips, index to wineries, and street index. $5.95 62-56745 1 sheet, folded. Napa & Sonoma City Maps maps. Various publishers. These are city street maps, not wine maps. Please click here for a superb collection of wine maps for California. $7.95 62-5682-04 Napa & Sonoma wine country map. Popular hand drawn map showing wineries, vineyards, shopping, etc. On waterproof paper. (MapEasy). $4.95 62-5682-03 Napa & Lake County Winery Locations. (Compass). A detailed black and white street map of the area. $5.95 62-5692NAP Napa & the Wineries city map. (GM Johnson). Mt. Whitney benchmark paperweight & lapel pin. Geo-Situ. Whether you're a climber, hiker, geography buff, or armchair traveler, you'll love to collect or give these unique bench mark paperweights that celebrate the spirit of exploration, athletic challenge, and personal achievement. Cast in pewter these summit marker paperweights are exact replicas of official USGS benchmark markers. Please click the "sample" button below to see an enlargement of the paperweight. Each marker has a soft felt pad on the bottom so these can be used on glass, wood, or any surface. Supplied in a soft fleece drawstring pouch, 3¼" diameter. Larger image of the Mt. Whitney paperweight. $9.95 67-9515 1" lapel pin. Mt. Whitney benchmark magnet. Geo-Situ. Whether you're a climber, hiker, geography buff, or armchair traveler, you'll love to collect or give these unique bench mark magnets that celebrate the spirit of exploration, athletic challenge, and personal achievement. These smaller replicas of the benchmark paperweights are ideal as inexpensive gifts or as refrigerator magnets or office note magnets for yourself. Additional benchmark paperweights for California locations. Geo-Situ. $39.95 62-5697BAD Badwater Basin, Death Valley paperweight. $39.95 62-5697BA Mt. Baldy paperweight. $39.95 62-5697CL Clouds Rest, Yosemite paperweight. $39.95 62-5697EL El Capitan paperweight. $39.95 62-5697GL Glacier Point, Yosemite paperweight. $39.95 62-5697HA Half Dome paperweight. $39.95 62-5697JO Joshua Tree paperweight. $39.99 62-5697BP Mt. Baden Powell paperweight. $39.95 62-5697LA Mt. Langley paperweight. $39.95 62-5697LB Mt. 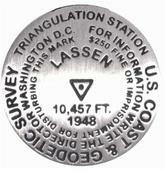 Lassen paperweight. $39.95 62-5697SH Mt. Shasta paperweight. $39.95 62-5697TA Mt. Tamalpais paperweight. $39.95 62-5697SG San Gorgonio paperweight. $39.95 62-5697SJ San Jacinto paperweight. $39.95 62-5697TP Telescope Peak, Death Valley paperweight. $39.95 62-5697W White Mtn. paperweight. Additional Benchmark lapel pins for California locations. Geo-Situ. These lapel pins are 1" diameter replicas of famouse benchmarks and are ideal companions to the 3" benchmark paperweights listed above. Made of pewter and with a clutch back. 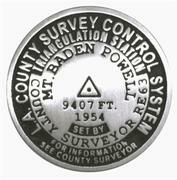 $9.95 62-5697BPL Baden Powell lapel pin. $9.95 62-5697BADL Badwater Basin lapel pin. $9.95 62-5697CLL Clouds Rest lapel pin. $9.95 62-5697ELL El Capitan GNIS lapel pin. $9.95 62-5697GLL Glacier Point lapel pin. $9.95 62-5697HAL Half Dome GNIS lapel pin. $9.95 62-5697BAL Mt. Baldy lapel pin. $9.95 62-5697LAL Mt. Langley lapel pin. $9.95 62-5697LBL Mt. Lassen lapel pin. $9.95 62-5697SHL Mt. Shasta lapel pin. $9.95 62-5697TAL Mt. Tamalpais lapel pin. $9.95 67-9515 Mt. Whitney lapel pin. $9.95 62-5697SGL San Gorgonio lapel pin. $9.95 62-5697SJL San Jacinto lapel pin. $9.95 62-5697TPL Telescope Peak lapel pin. $9.95 62-5697WL White Mountain lapel pin. Benchmark Magnets. 1-1/4-inch diameter benchmark magnets. Cast in fine pewter. $10.95 62-5697CLM Clouds Rest, Yosemite National Park, CA magnet. 9,926 ft.
$9.95 62-5697LBZ Mt. Lassen, Lassen Volcanic National Park, AZ magnet. 10,457 ft.
$10.95 62-5697WHM Mt. Whitney, Yosemite National Park, CA magnet. 14,494 ft.